Heritage | Oh My Tiny Little Pea Head! It’s funny, I never know what to say when people ask me about my heritage. Sure, there is some Irish in there. You can see it in my sister and niece. For me, really only in my beer drinking ability. The fact of the matter is – I am American. My sister & I were born in America, our parents were born here, and so were their parents. We are New Englanders, through and through. My dad is from a small town in Vermont, my mom a small town in New Hampshire (separated by the Connecticut River). My sister & I grew up in Connecticut and we have both lived in Massachusetts for 25 years now. Aunts, uncles, and cousins – spread out, but all in New England. Greg, on the other hand, was the first one in his family born in America. His family is from Wales. Mom, dad, brother, grandparents, aunts, uncles, cousins – the whole lot of them. His dad was an aerospace engineer and in the mid-60s, AVCO Lycoming in Stratford, CT (the same place my mom & dad worked!) was advertising in Great Britain for engineers to come to America. So, in their early 20s, with his 2-1/2 year old brother in tow, Greg’s parents moved to America. It was a gutsy move. They have now been in this country for almost 50 years – the first 30 in Connecticut, this past 20 in Southern California. They go back “home” to visit every few years, but never looked back. So, this year as his parents journeyed home to visit family and friends, we went along. It’s been 10 years since Greg’s last visit, and Ethan (his son) and I had never been. It was great! 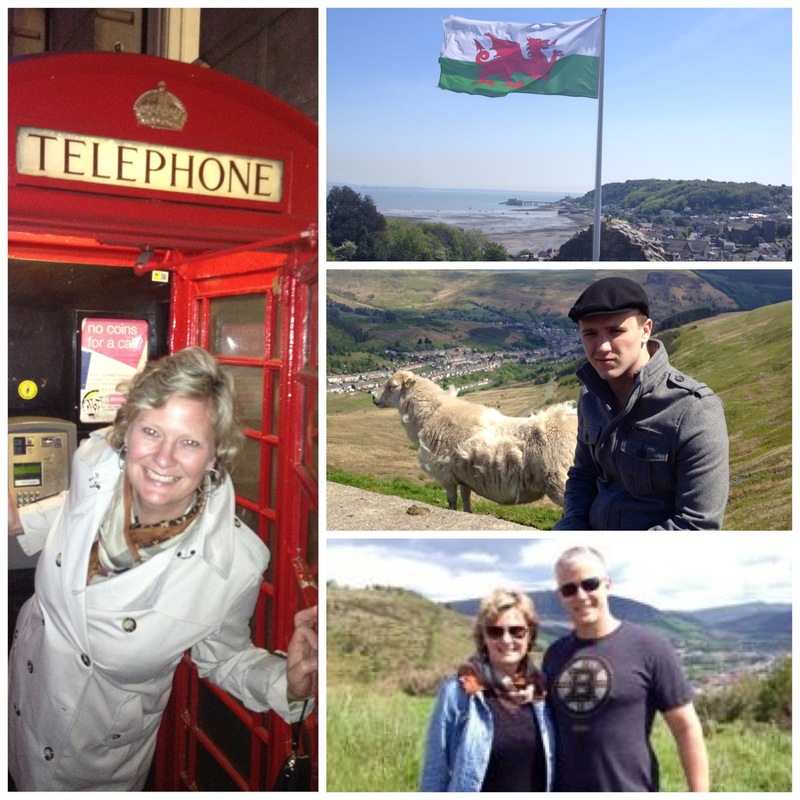 After spending the weekend in London, we met up with his parents and Auntie Caryl in Wales for the balance of the week. We did it all – family, sights, pubs, fish & chips! I really enjoyed it. As they would say – Lovely! I learned so much more about his family, their history, and their culture (and I’ve known them for 30 years!). Although Greg’s family isn’t close by, he has good strong roots, just like me. Lovely. Your hair is getting so long. You look great. Love the thinking. Love the post. Oh, and just love that America!